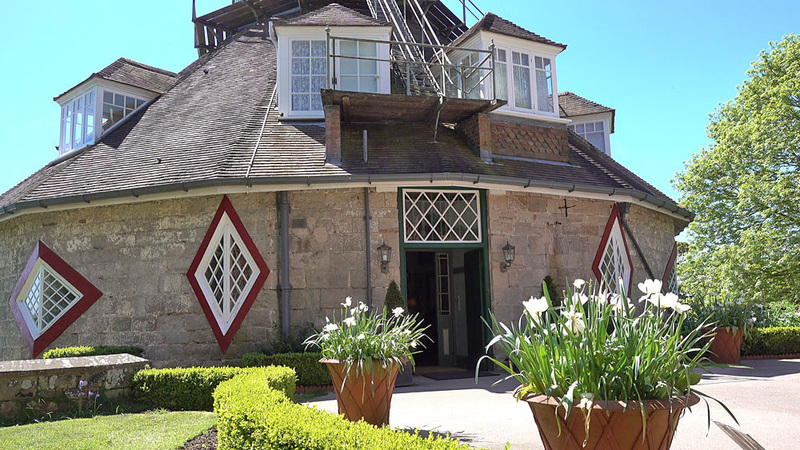 A la Ronde, near Exmouth in Devon, is owned by the National Trust. It was built in 1796 for two spinster cousins, Jane and Mary Parminter. Jane was the daughter of a rich merchant. Following the death of her father, Jane decided to set up home in Devon together with her cousin Mary. They purchased a plot of land near Exmouth and had A la Ronde built. We visited in May 2018. The following stills are from the video. They lived quiet lives, occupied with handicrafts such as needlework and creating pictures with sea shells. Jane died in 1811 leaving the property to Mary. The terms of Mary’s will specified that the property could be inherited only by an “unmarried kinswoman”. This condition held firm until 1886 when the house was transferred to the Reverend Oswald Reichel, a brother of one of the former occupants. Reichel was responsible for major changes to the house. These included the construction of upstairs bedrooms with dormer windows, the fitting of first-floor windows, the replacement of the original thatch with roof tiles and the addition of an external catwalk. Jane and Mary were regular attendants at a Chapel in Exmouth, but as the two ladies got older they found the journey to worship increasingly difficult. Therefore they had ‘Point in View’ chapel built on their own estate. Surrounding the chapel was a small school for six girls and almshouses for four maiden ladies of at least 50 years of age. This entry was posted in Public Gardens and tagged England, National Trust, public garden on 31/05/2018 by David Jefferson.